Well, I have been having a blast these past few days. 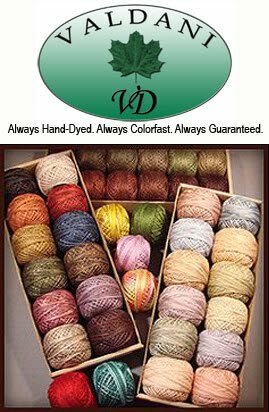 I am in a wool rug hooking retreat here in Jacksonville and I'm in "WOOL HEAVEN". All you can see - across the entire room - are heads of people (working on their projects) and beautiful wool everywhere! I'm waiting to post pictures until the entire weekend is over with. We have a show (for those that have 'finished' projects to display) where I'm taking lots of pictures and I'll post them for you. Along with pictures of the hooking room, etc. So... I have to post before it's time to take off and HOOK!!! I found another adorable Annie!! This is a pattern... 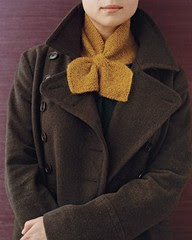 I'm thinking I might have to purchase one and put it in my 'pattern library'! Do you have one of those? It's getting rather large .. I must admit! I'm sorry if the picture is a bit blurry.... Isn't she a hoot. I love the way they did the stitching around her eyes. Her poor little nose... it's a bit of a mess ... but I sure do like it! 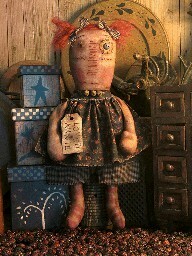 She'll be added to my collection. Hey... I almost forgot our "feel good" photo. Now this one... is something else!! Remember the terminioloy - "FAT CAT"? Well... this is one. Poor fella... how in the heck can he walk? 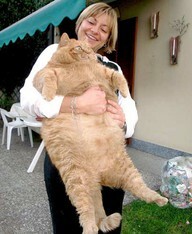 We had a fat cat when we were kids... but it did not even compare to this BIG DUDE! How in the heck can he clean himself? I wonder what size CAT PAN they have for this bad boy? Whew! I feel pretty darn skinny right now... don't you? I'd love to know what his name is! I decided I would pick fun things to make for today's blog. It simply amazes me what people can think of to make ... and how talented they are. I saw this sweet little bird... I love birds..don't you? When we had wonderful birds in the store they "flew" out the door (tee hee) with customers taking them home. People just love sweet birds. We can make this one!! Here is the link for you. 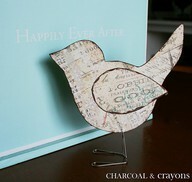 Sweet Sparrow If you get ambitious and make one.. .can you send me a photo please! I'd love to see it. Then... look at this awesome table runner. I thought of my friend - Michal - she loves old books and this it right up her alley! You simply buy one of the paper punches for 'edges' and go to town. 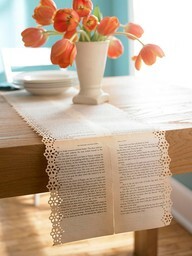 Here is the link for instructions: Book pages table runner . 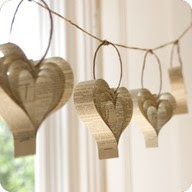 Wouldn't it be adorable to make for a wedding shower? Or for the table at the wedding where everyone signs in at the guest book? It would even be cute from colored pages from a book or magazine! Let's say you're having a dinner party and you want it to be some type of a theme. Find those pictures from magazines, tape them together, do your magic with the paper punch and you have a great idea for a centerpiece. What a great way to get the conversation going! Then... we have these beautiful hearts!! You could even make them colorful... get you some gorgeous paper from the craft store... wow.. they would be so cute out of pastel colors!! I love this little scarf. It's a little impractical for here in Florida... but I still love it! Isn't it sweet? And it looks so warm. Would you like to make it.. .here's the link! Ok... it's time to get going... I must begin my hooking again... HAHAHAHAHAHA!!! I'll chat with you tomorrow... here is your organization tip for the day! Clean out your make up drawer - ditch that stuff you no longer wear, throw out the nail polish that is all icky!!! You'll feel so much better!